Enjoy this post? Share it with your friends! 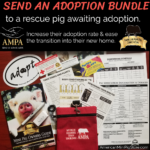 The mission of the American Mini Pig Rescue Advocates is to protect mini pigs through education, advocating, supporting, networking, encouraging support in the mini pig community of rescue organizations, to help keep pigs in their homes, to connect adopters with adoptable pigs, to encourage thorough screening, to improve rescue practices, to encourage responsible rescuing, and to bridge the gaps in the community for the betterment of rescued mini pigs. To protect those without a voice.